Last week I asked did an 8 cylinder radial engined plane cross the Atlantic? The answer is obviously no, as radial engines have to have an uneven number of cylinders, 7 cylinder or 9 cylinders, but never 8. So to this week. Study the photograph – what is it, and who drove it? I want to know both. Kia reported the fewest problems per 100 vehicles in the first 90 days of ownership, narrowly beating second place Porsche. It is the first time a non-premium brand has claimed the study’s top spot since Toyota in 1989. 21 of 33 brands improved as overall industry quality rose 6 percent compared to 2015. The study, released at an Automotive Press Association meeting in Detroit, also found that domestic brands outperformed their imported rivals for just the second time in the study’s 30 year history. The study, which many buyers consult before purchasing a new car, looks at problems new owners have in the first 90 days with a vehicle. The lower the score, the fewer the number of defects and the higher the vehicle quality. Hybrid vehicles are all around us. Most of the locomotives we see pulling trains are diesel-electric hybrids. Cities like Seattle have diesel-electric buses. Giant mining trucks are often diesel-electric hybrids. Submarines are also hybrid vehicles - some are nuclear-electric and some are diesel-electric. Any vehicle that combines two or more sources of power that can directly or indirectly provide propulsion power is a hybrid. Now hybrids are really nothing new (actually there is very little that is ‘new’ in the automotive world). 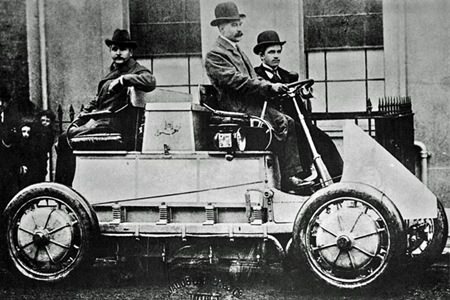 In 1901, a brilliant engineer called Dr Ferdinand Porsche built the Lohner-Porsche. This was the world’s first ‘series’ hybrid where the electric driving motors were powered by batteries, and the batteries were in turn charged up by an on-board petrol engine generator. Porsche used two ‘in-wheel’ motors, a design that has been used by Mitsubishi in the MiEV range. The interesting fact about Dr. Porsche’s design is that the Lunar Lander used the Porsche in-wheel electric motor concept as well. Now whilst a hybrid is combining two different power sources, there are different ways of going about this too. One way, known as a parallel hybrid, has a fuel tank that supplies gasoline to the engine and a set of batteries that supplies power to the electric motor. Both the engine and the electric motor can turn the transmission at the same time, and the transmission then turns the wheels. With the parallel hybrid system, either gasoline or electric power can be used. Petrol can assist electric and vice versa, and both can run together as well as being the single power source, generally at starting the vehicle. Simplifying all this, the fuel tank and petrol engine connect to the transmission. The batteries and electric motor also connect to the transmission independently. As a result, in a parallel hybrid, both the electric motor and the gas engine can provide propulsion power. By contrast, in a series hybrid, the petrol engine turns a generator, and the generator can either charge the batteries or power an electric motor that drives the transmission. With this system, the gasoline engine never directly powers the vehicle. 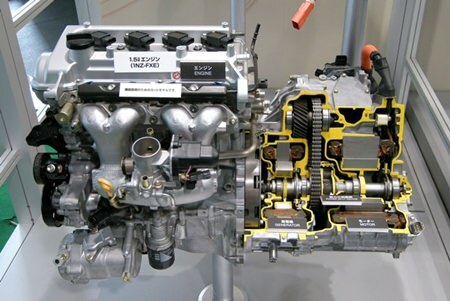 If that isn’t enough complication, the Toyota Prius has what is called the Hybrid Synergy Drive. This is really a combined hybrid (sometimes referred to as series-parallel), a vehicle that can be propelled by gasoline (petrol) and/or electric power. The Prius gets its good fuel consumption figures through many factors, including: regenerative braking, using motor-generators, which converts kinetic energy of motion into electrical energy that is stored in the traction battery. The gasoline engine normally shuts off during traffic stops and the accessories (including the air conditioning) are powered by the battery pack. The engine is used both to propel the vehicle and to recharge the batteries (combined series/parallel). Because of the availability of extra power from the electric motors for rapid acceleration the engine is sized smaller than usual thus giving increased fuel efficiency and lowered emissions with acceptable acceleration. Two electric motor/generators are used: MG1 and MG2. MG1, reversible and up to 10,000 rpm, starts the engine and provides counter torque for the Continuously Variable Transmission (CVT). MG2 provides 50 kW (67 hp) between 1,200 to 1,540 rpm and 400 Nm torque between 0 to 1,200 rpm, contributing to performance and economy. A Hybrid Synergy Drive (HSD) unit can combine a planetary gearset that behaves like a Continuously Variable Transmission (CVT) and is called the Power Split Device to increase efficiency. 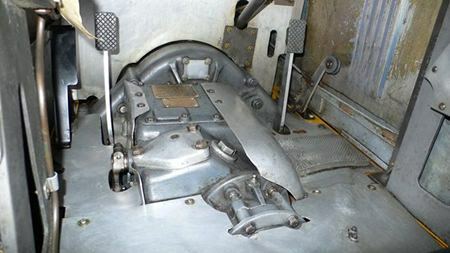 The computer controlled HSD transaxle adjusts and blends the amount of power from the gasoline engine and electric motor-generator(s) as needed by the front drive wheels and rechargeable batteries. A sealed 38 module nickel metal hydride (NiMH) battery pack providing 273.6 volts, 6.5 Amp/hr capacity and weighing 53.3 kg is supplied by Japan’s Panasonic. There is yet another type of hybrid. This is called a plug-in hybrid (PHEV). These use a larger electric vehicle battery pack that is recharged from external sources in order to further reduce fuel consumption. The NiMH batteries in a production PHEV will be built to handle deeper discharge cycles without loss of lifespan such as the NiMH battery pack in the Toyota RAV4 EV. Operation of the vehicle will be very similar to a normal hybrid, except that the electric operation will be more prevalent. In the case of a Prius PHEV, on the highway, the gasoline engine will operate as before, leaving the car with the same ability to accelerate and use freeways. When driving in slower conditions or with light loads, the batteries will be used first in a charge-depleting mode, allowing moderate commutes at low speeds (particularly under 65 km/h) to be driven entirely on electricity. Once the batteries have been sufficiently discharged the car will automatically revert back to the charge-sustaining mode of a normal Prius operation. While some sections of the auto industry look upon hybrids as the answer to our present crude oil ‘end of the world as we know it’ situation, but there are others that just see the combination of gasoline and electric as merely a ‘half way house’. I would agree with that sentiment. Why waste even more time and research resources on what is really very outdated technology. 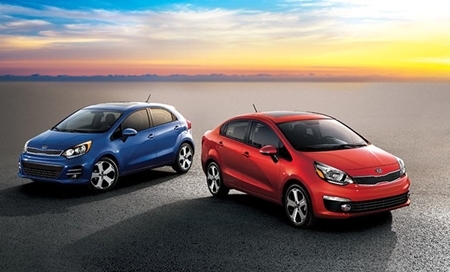 The newer all-electric vehicles have much more to offer us in the long run. And free us from being held to ransom by the pimps at the pumps. However, in the EV scene, Tesla is leading the charge (pun intended)! More on that another day! The Austrian Grand Prix returns to Austria and the Red Bull Ring. The circuit has had a revamp from Red Bull and Red Bull Racing will naturally be hoping they can get a win on home soil. The “Ring” has seen many configurations of the track, mainly to slow the cars down, as speeds of up to 256 km/h for a lap average have been recorded previously. 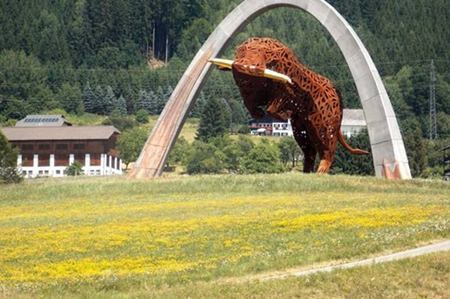 In July 2013, Red Bull announced that the Austrian Grand Prix would return as a round of the Formula One World Championship in 2014. This was confirmed on 4 December 2013 when the 2014 Formula One schedule was released and included the Austrian Grand Prix which was held on 22 June 2014. The telecast of this year’s race begins at 7 p.m. Thai time and we will be watching in front of the big screen at Jameson’s Irish Pub (Soi AR) and we get there around 6 p.m. for something to eat and a convivial drink or two before the race starts. Come in a koala suit and barrack for Ricciardo and I’ll get Kim Fletcher to buy you a beer or a eucalyptus leaf or something. Last week I asked which car company, during the war years, offered electric windscreen wipers, as well as the vacuum operated ones? Having had a car with only vacuum wipers, I can see why electric ones were necessary. It was Ford Motor Company and my vacuum wipers were on a 1953 V8 Customline. So to this week. Which make of car was excluded from a special race in Holland, because it was just too good for the opposition? For the Automania FREE beer this week, be the first correct answer to email [email protected] or [email protected] . Good luck!